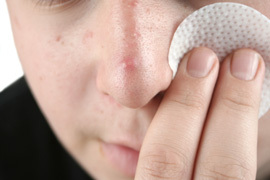 Though the exact cause of acne has not been determined, research has shown that four key elements contribute to acne. They are: excess oil, clogged pores, bacteria, and inflammation. During adolescence, the body begins to develop more sebum oil, which is produced to ensure our skin does not dry out. When sebum cannot flow freely to the skin, clogged pores result. Bacteria already found on the skin’s surface, flourishes in the excess oil, and causes inflammation. Isoretinoin is an oral medication that is only used for the most extreme cases of acne. Isoretinoin reduces the size of the skin’s oil glands and the amount of oil the skin produces. The reduction in oil also leads to the reduction of bacteria living in the skin. Isoretinoin also slows down how fast the skin produces skin cells inside the pore, which helps pores from becoming clogged. There are many severe side effects of Isoretinoin, such as depression, birth defects if taken while pregnant, which is why it is important to consult with Dr. Jay, understand all the risks, and decide whether the Isoretinoin is right for you. If scarring from acne occurs, some options such as laser therapy may help reduce the appearance of scars. Talk to Dr. Jay if you are interested in this type of treatment. Research has proven that heredity, hormones, menstruation and emotional stress can trigger acne, or make it worse. Although many of these factors cannot be avoided, it is recommended that patients not wash or scrub the skin excessively, which can irritate the skin and make acne worse. Diet does not generally contribute to acne, although if greasy foods are ingested often, oil from the food may transfer onto the skin, particularly around the mouth, and worsen acne. Likewise, if you have oily hair, shampooing often may help reduce the risk of oil from the hair transferring onto the skin.